"Among women who exercise, the ratio of 'good' estrogens to 'bad' estrogens [those that can damage DNA and increase a woman's breast cancer risk] improved by roughly 25%. As many of you know, October is Breast Cancer Awareness Month. This year Macy’s teamed up with The Breast Cancer Research Foundation (BCRF) dedicated to preventing breast cancer and finding a cure. When I was contacted to take part in the campaign I was excited but especially honored because the cause hits close to home. Right after my little sister was born her mother was diagnosed with cancer. I witnessed one the coolest/funniest persons I knew go through a low point. At that time I was eleven or twelve and didn't completely understand, let alone have a solution to what was happening. But somewhere during all of that our family found ways to laugh and keep our minds off it when we could. Before I get all emotional I just say that she since survived cancer but my worries don't stop there. The average woman in the United States has about a 1 in 8 chance of developing breast cancer in her lifetime. As I get older I'm starting to realized that my health is affects my day to day life just as much as the long run. My diet, fitness, and mental health are something I'm working on as I creep into my mid-twenties and facts like that make me want to take more control. I've started cooking healthier meals and eating a lot less fast food (especially since I tend to regret the latter soon after consuming). Harvard researchers recently found that women who had the highest carotenoid (found in fruits and vegetables such as leafy greens, carrots, and red peppers) levels in their blood had a 19% lower risk of breast cancer than those with the lowest levels. One of my more recents efforts a trip to my OBGYN to get the proper exams done. I've always been one of those people who did everything NOT to go the doctor. Relying on self-treatment, rest and little bit of WebMDing to maintain 100 on the health meter (ala SIMS game). But after back to back health issue I've faced the fact that it's better to get a professional opinion and that speaking up when something feels off is worth spending time in a waiting room. With that being said I urge you to schedule (and go to) your annual exams, listen to your body and treat it good with some exercise and good food. What you do now can prevent what you may have to go through later. 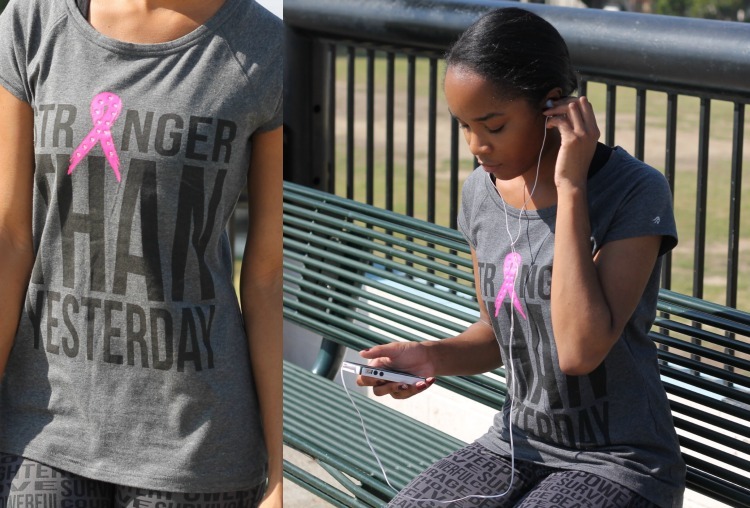 From October 1, 2014 through November 1, 2014 you can get your Breast Cancer themed workout gear by Ideology and Macy's will donate a 5% of the sales to the BCRF. There are also tons of other ways to support the Breast Cancer Research Foundation from Pink themed fragrances to cute baking supplies over on the Macy's site. And don't forget to wear your a pink ribbons!